Tommy Tanzer, a resident of Park City, Utah, received three negative prostate biopsies over the course of three years, but he and his doctors still suspected he may have prostate cancer. Tommy then had an MRI-guided biopsy at Huntsman Cancer Institute (HCI), hoping there would be a more accurate result. Unfortunately, this biopsy did detect cancer. Fortunately, it was found early enough to treat. MRI-guided biopsy is a new technology recently brought to HCI, the first in the region to offer it. With this test, a radiologist can do a biopsy in an MRI suite and use the MRI to target a specific spot of interest, providing much more accurate results. This procedure is primarily used for patients, like Tommy, who have had multiple negative biopsy results despite blood tests showing high prostate-specific antigen (PSA) levels, which can indicate cancer. 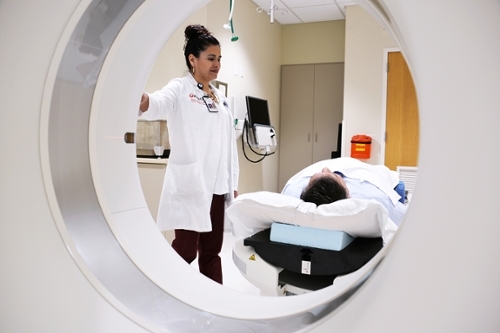 HCI also offers the latest technology in CT scanning that yields better images of tumors. In 2017, HCI was the first cancer center in the United States to use a new, state-of-the-art CT scanner that arms radiation oncologist oncologists with more information than ever before. Called the Somatom Confidence 64 from Siemens, the scanner helps doctors plan radiation treatments. It creates more detailed images than older CT scanners, so they can direct the radiation therapy precisely where it is needed and spare healthy tissue. In 2018, HCI also started Hyperthermic Intraperitoneal Chemoperfusion (HIPEC), an innovative way to deliver heated chemotherapy to some cancers in the abdomen. HCI is one of only a handful of centers in the country and the only place in the Mountain West region to offer this unique service. As cancer treatment and technology continue to advance, HCI remains at the forefront of innovation and will soon offer a new type of cancer care to patients: Chimeric Antigen Receptor therapy (CAR-T). CAR-T received approval from the Food and Drug Administration in 2017. The unique approach shows promise in certain adult and childhood blood cancers, and HCI will help advance research to better understand this new therapy. HCI also announced its plans to add an Intensity-Modulated Proton Therapy (IMPT) Center, set to open in the fall of 2020. Proton therapy treatment is an effective radiation therapy option for numerous types of cancers, including childhood cancers, head and neck tumors, brain tumors, lymphomas, and prostate, pancreas, and esophageal cancers. Proton therapy is often the preferred treatment choice when a tumor is close to a vital organ, such as the spinal cord or brain stem. Currently, the nearest proton facility is a 10-hour drive from Salt Lake City. This new cancer treatment technology will continue to help patients across the Mountain West.